Both teams want to win to go up the standings. In trouble since the start of the season, Leverkusen ranks a disappointing 13th place in the Bundesliga with 2 units ahead of 16th. Victorious only once in the last 5 days, for 2 defeats and 2 draws, Julian Brandt’s partners remain on a heavy setback conceded in Leipzig before the international cut. Bundesliga Red Lantern, Stuttgart conceded 2 points behind the first non-relegation formation. Before the truce, Benjamin Pavard’s partners won at Nuremberg (2-0), putting an end to a terrible series of 4 setbacks. 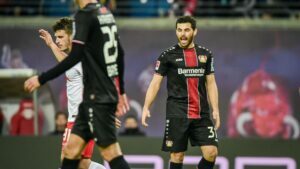 The Leverkusen coach is without goalkeeper No 2 Kirschbaum, long-time absent Pohjanpalo and potential holder Bellarabi, all stranded in the infirmary. The Stuttgart squad is weakened by the injuries of rookies Sosa and Kliment and usual substitutes Donis, Meyer and Ozcan.